Well first off who needs air capability? Including planes in an FPS game just reduces the size of the firefights in my opinion also I think the only way to include air fights is if they flew in schwarms and not lone wolfing around like they do. I think the same with ARMA 2. If you delete air capability then you have a lot of games to chose from. Well, the unreal engine for one. DH1 which is based off the old Ut2004 version and it is more than possible to have up to 64 people + ( I think the 29th server has up to 70 slots now) as well as some basic plane code. A few people have tried to get planes in RO1 I believe the Revenge of the Turul Mod has a flying Stuka "G" (the Stuka B model static mesh with a cannon mesh under wings) in one of their maps. Plane warfare should be left for the simulations. After playing IL-2 Stumovik I just laugh at the arcadeness of all other WW2 games with planes. I always thought being able to call in AI planes would be cool. Like calling in Stukas to bomb somewhere. Ha, FH3? Never. BF3 isn't moddable, at all. That game is like impossible to lag. 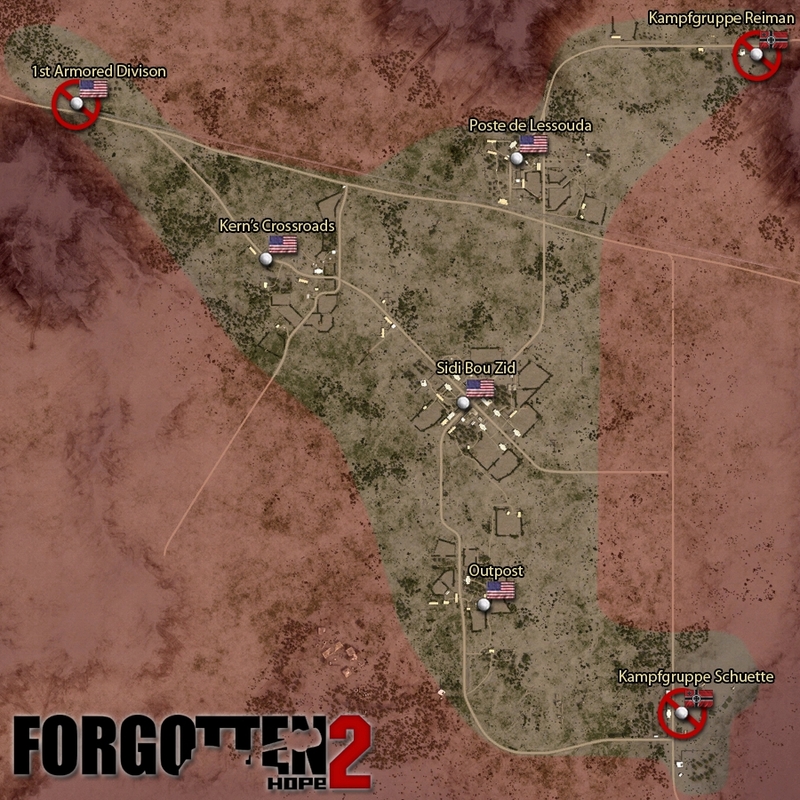 Ever since the initial release of Forgotten Hope 2, the only main armies featured on our North African maps were the British, Italians, and Germans. 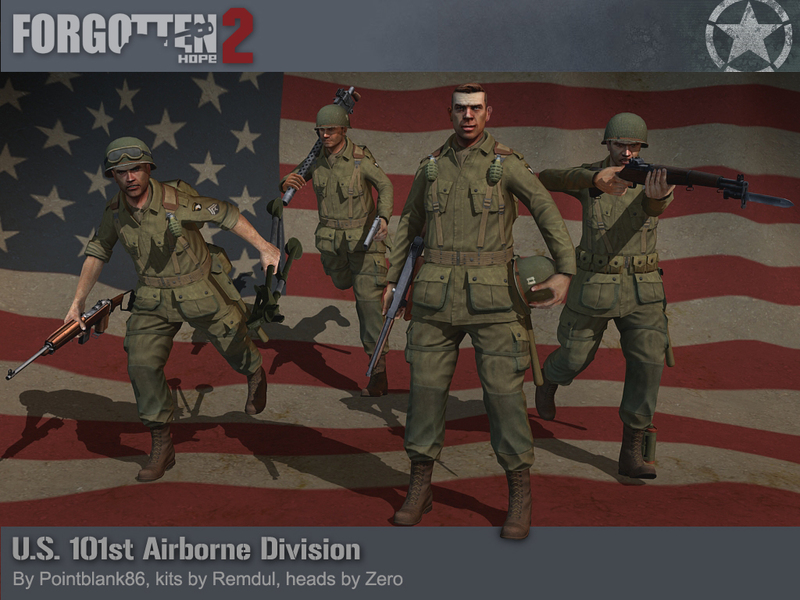 We are pleased to announce that in the next patch, the United States Army will be joining that list! 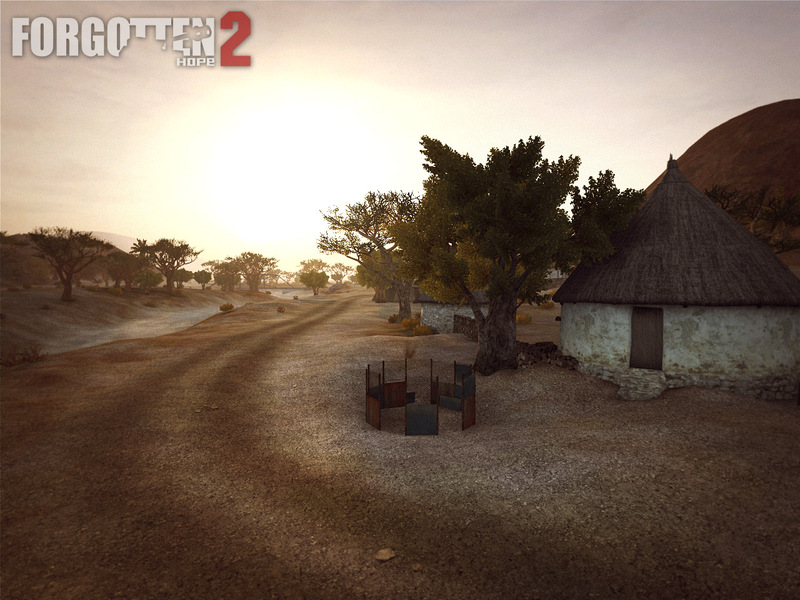 The first new map that was shown is takes the players to Eritrea in east africa for the first time. 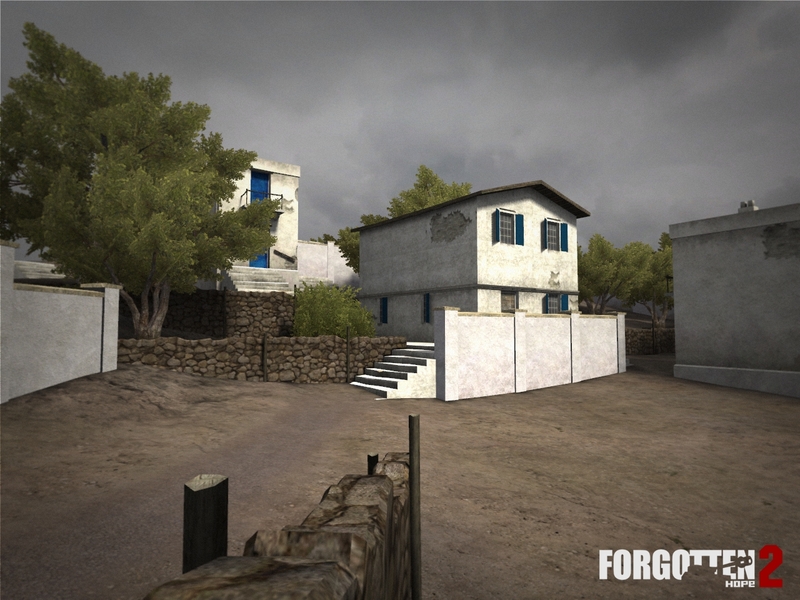 To make the map unique, several new British and Italian early war assets were created. Any multiplayer videos from this new release? I'm interested in how much different FH2 plays than the versions I played in the past. Depends on which versions you played. There are lots of gameplay videos from the latest public version. 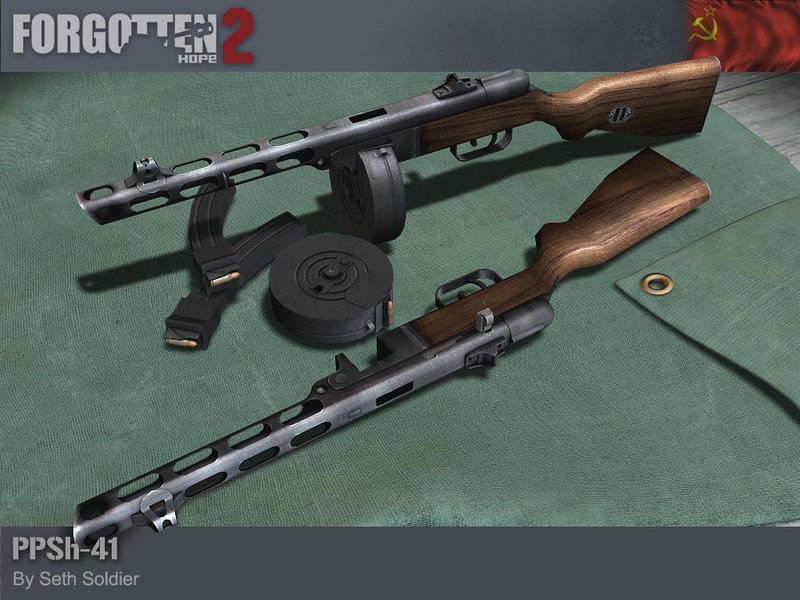 Up first we have a brand new aircraft-mounted, German machine gun, the Mauser MG81. Intended to replace the older, magazine-fed MG15, the MG81 was a belt-fed, aircraft-based machine gun in production from 1940 to 1945. It saw use as both a single and twin mount (MG 81Z) in various Luftwaffe aircraft, including the new Ju87 D-1 Trop shown below. 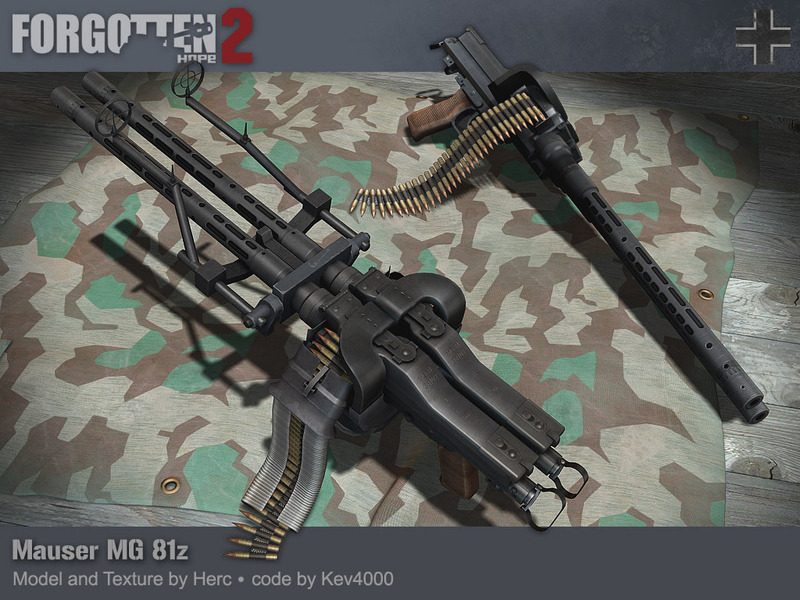 The MG81 was made by Herc and exported by Kev4000. Our next two renders are of an updated version of an aircraft that has long since been in FH2. 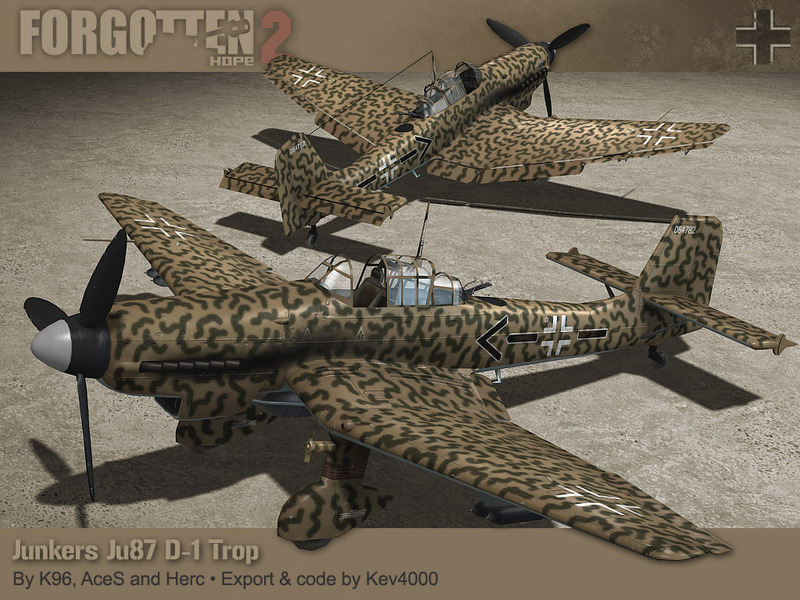 It is the Ju87 D-1 Trop. The Junkers Ju-87 D-1 came into service shortly after the Battle of Britain, and included several improvements over previous versions. 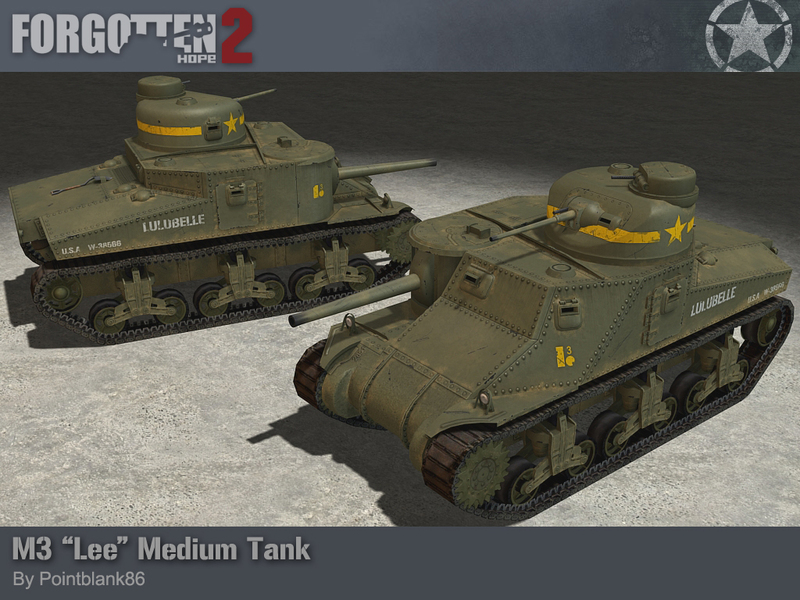 Such changes included a better cockpit, more armor, an increased bomb-load, a more powerful engine, and a rear-facing MG 81Z for protection. 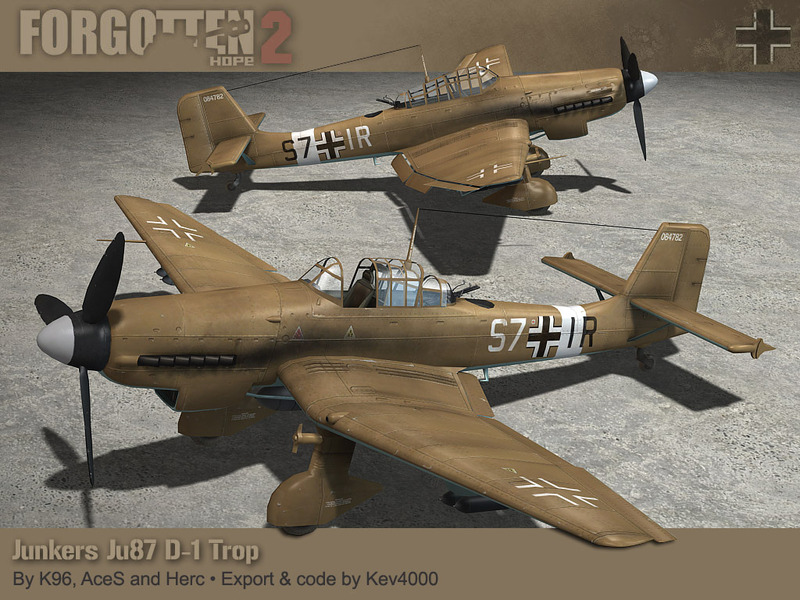 The Ju-87 D-1 Trop was made by K96, AceS, and Herc, and was exported by Kev4000. Today we are very excited to reveal something that has been sitting idle in our "vault" for quite some time now. It is the Curtiss-Wright P-40E Kittyhawk! The P-40 was a single-seat, all-metal fighter/ground-attack plane that was developed by the American, Curtiss-Wright Corporation. Its design was nothing more than an updated version of the earlier, Curtiss P-36 Hawk. Armed with 6x .50 M2 Browning machine guns, the P-40 saw extensive use 28 different air forces, across a host of different battlefields. 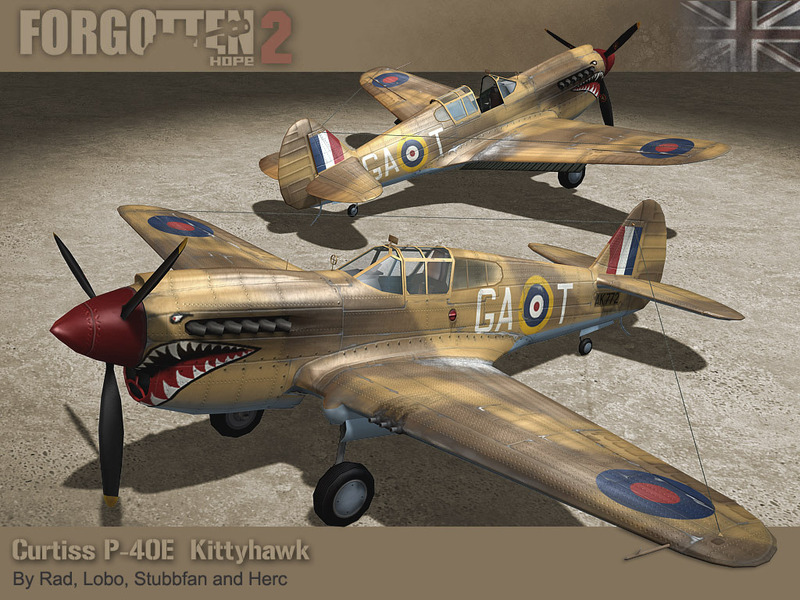 Known to the British as the "Kittyhawk", the P-40 would play a critical role in North Africa, providing close air support. Nearly 14,000 P-40s were built by the time production ceased in November of 1944. The P-40E Kittyhawk was originally made by Rad and Lobo, finished by Herc, and exported by Stubbfan. It has been a few weeks since our last update, and to make up for that, we have an update that is jam packed full of new content. To kick things off, we have a render of a new type of grenade for the common US infantry solider; the Mk. III A1 Offensive Hand Grenade! The Mk. III was a concussion grenade, and was designed to incapacitate targets through the pressure and impulses produced when the grenade exploded. The weapon contained 8oz. of TNT and would often throw large fragments of the fuze assembly and surrounding material up to ranges 200m, despite the fact that the Mk. 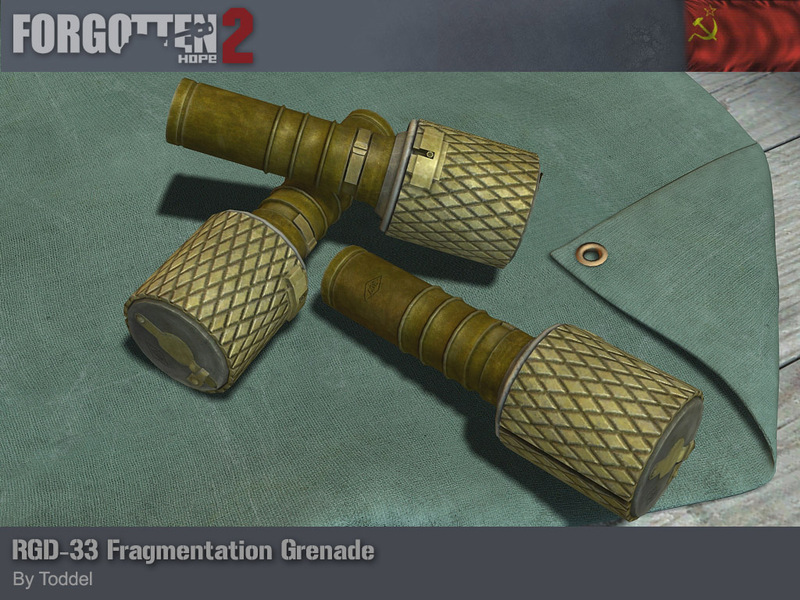 III was not a fragmentation grenade. The large explosions produced by this grenade made it not only successful against enemy soldiers, but also as an effective tool for blasting and demolition. 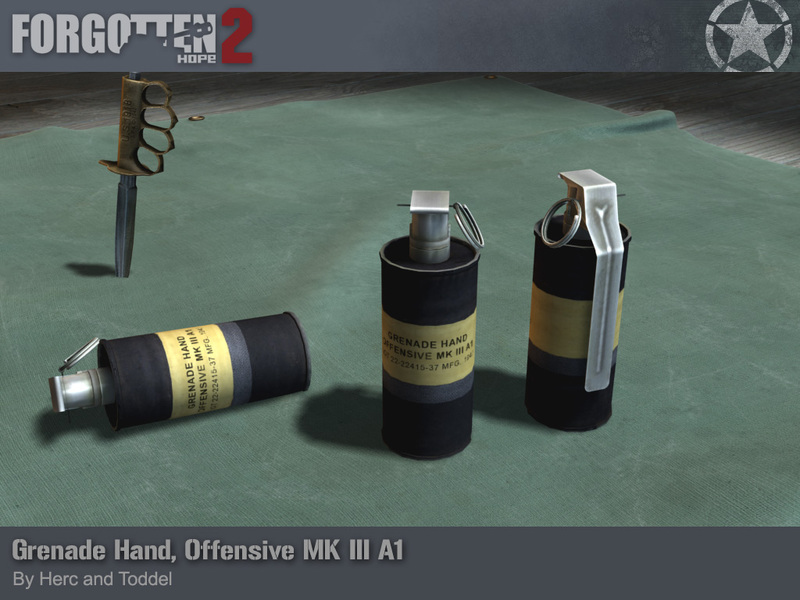 The Grenade Hand, Offensive Mk. III A1 was made by Herc and Toddel. Up next we have a render of the first ever machine gun that was fired from an aircraft; the Lewis Aircraft Gun! The Lewis gun in its aerial configuration was used extensively on British and French aircraft during the First World War. Its popularity came from being light-weight, air-cooled, and the fact that it could be fitted with 97-round drum magazines. By World War II however, the Lewis Gun was largely replaced on aircraft by the Vickers Gun, which could achieve twice the firing rate of the Lewis. 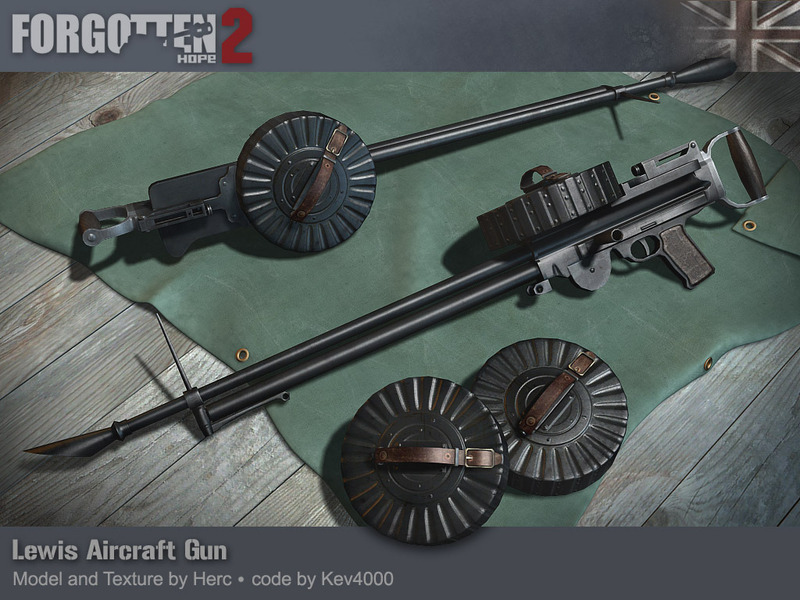 However, the weapon was still used on some British and US Army aircraft, and in FH2, the Lewis Gun will be present on the back of the Hawker Hardy. 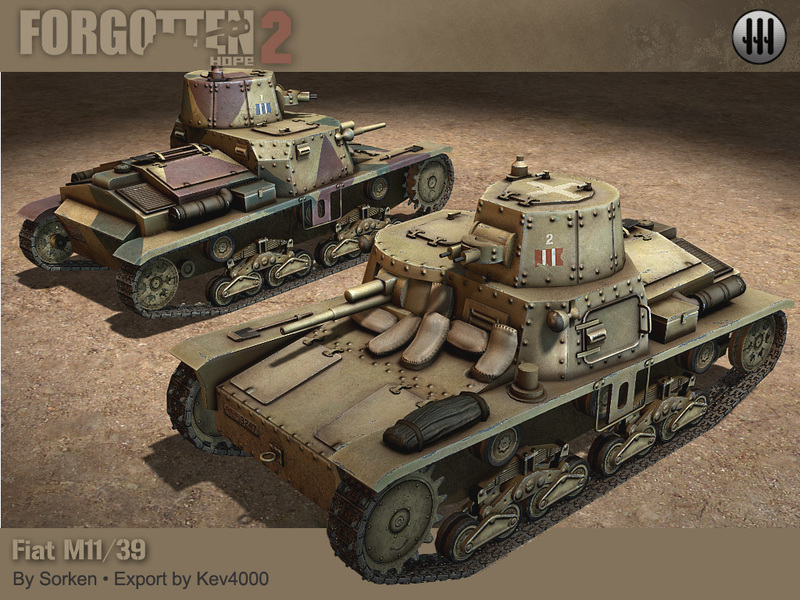 The Lewis Aircraft Gun was made by Herc and exported by Kev4000. Our next render is of a new aircraft for the American pilots serving in the harsh deserts of North Africa; the Supermarine Spitfire Mk. Vb Trop! Although the Spitfire had already proved successful in the RAF, the Sptifire was used to equip the 4th, 31st, and 52nd fighter groups of the USAAF in the summer of 1942. The Spitfire Mk. 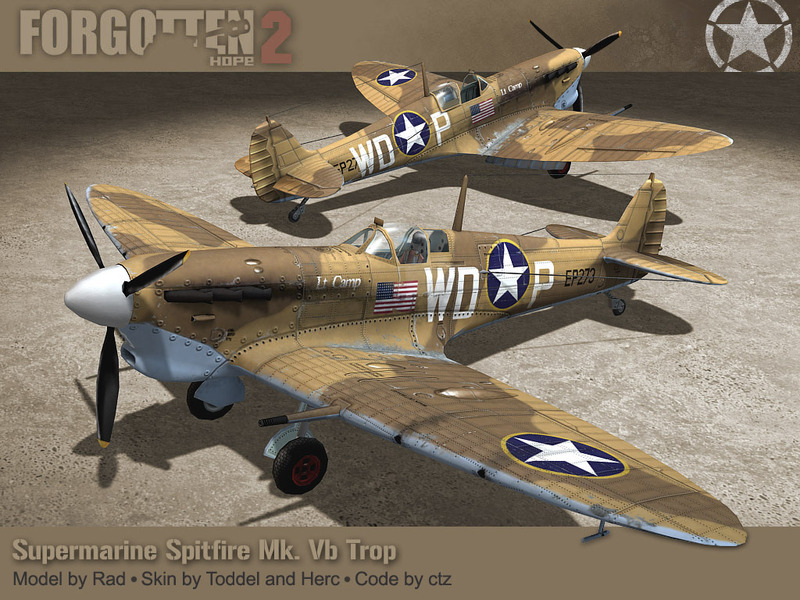 Vb Trop was created by Rad, textured by Toddel and Herc, and exported by ctz. 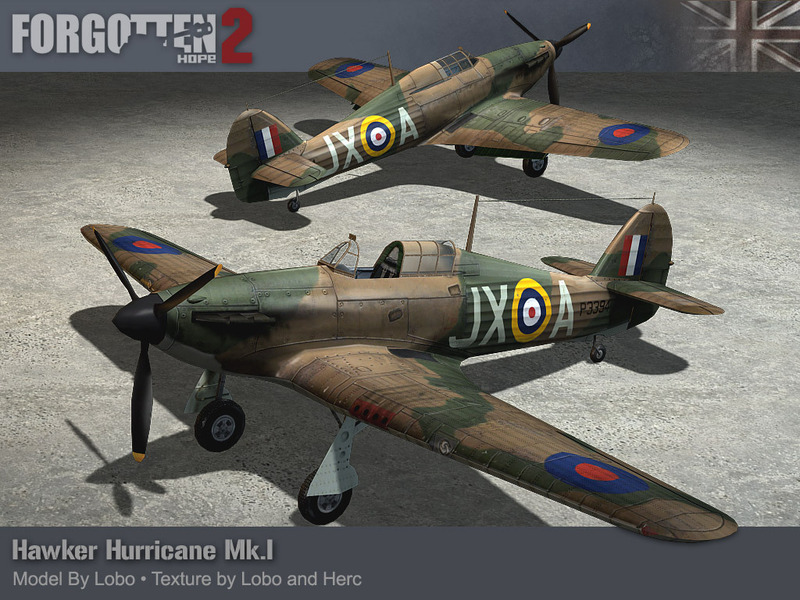 In 1939, several changes were made to the design of the existing Hurricane. These included a new powerplant, the Merlin III, a new metal propeller, new radios, and Identification Friend or Foe (IFF) equipment. Additionally, the aircraft was armed with eight, closely grouped .303" machine guns which provided an excellent field of fire. During combat, it was discovered that the Hurricane's fuel tanks were vulnerable to machine gun fire from enemy bombers, which could then ignite the aircraft mid flight. However, despite this the Hurricane would go on to be extremely successful during the Battle of Britain and would ultimately down more aircraft than the Spitfire. The Hawker Hurricane Mk. I was made by Lobo and textured by Lobo and Herc. This week we have a render of some long requested playermodels. The 101st Airborne Division has finally dropped onto the battlefield! Activated on 16th August 1942, the 101st had "no history, but it had a rendezvous with destiny." The division was shipped over the Atlantic in preparation for the invasion of France. The 101st were given the task of dropping onto the Cotentin Peninsula and securing vital objectives such as the causeways leading off Utah Beach and bridges and locks along the Douve River. 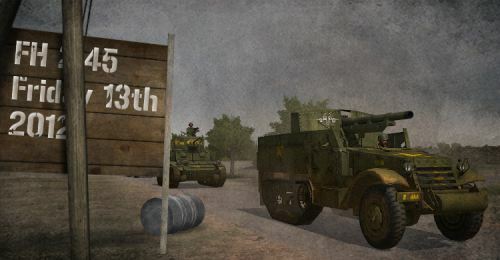 The drops were scattered and it took several days before the division was organised and had completed its objectives. 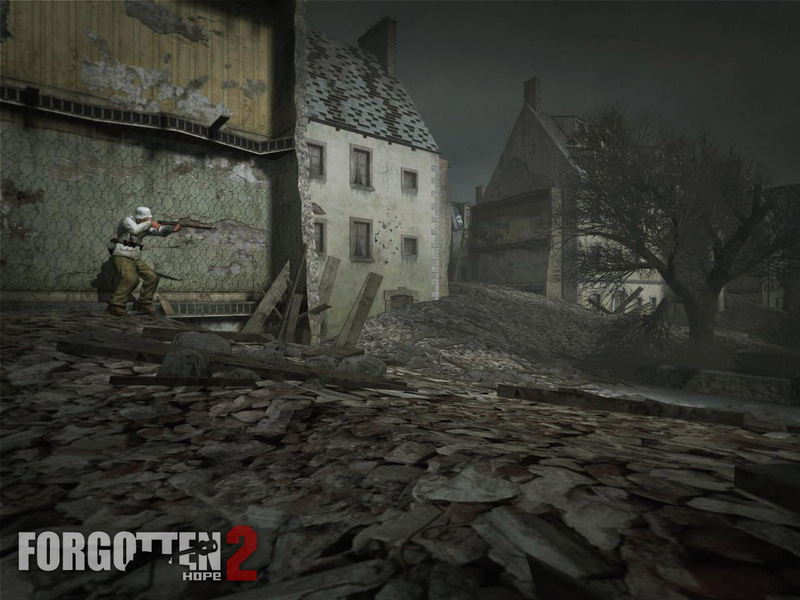 The division dropped again during Operation Market Garden, where it secured several bridges between Nijmegen and Eindhoven. After 72 days combat, the division was pulled back to France for rest and relaxation, which was cut short by the German offensive through the Ardennes. Besieged at the crossroads town of Bastogne, the 101st refused to surrender and despite critical shortages of ammunition and medical supplies they held on until the siege was broken by Patton's 3rd Army. No member of the 101st has ever agreed that the division needed to be rescued. Their last action in Europe was the capture of the Berghof. The 101st received 2 Presidential Unit Citations and suffered 2090 killed and 6388 wounded. The playermodels were modelled by Pointblank, with heads by Zero and kits by Remdul. Although this comes a full year after the last release, we think that the many changes that have been made in this time will make version 2.45 well worth the wait. Remember to stay tuned throughout the week for more information and of course the all important final part this Friday. We would also like to give a special 'thank you' to our beta testing team. Without their continued support and dedication, there would be no FH2 as we know it. 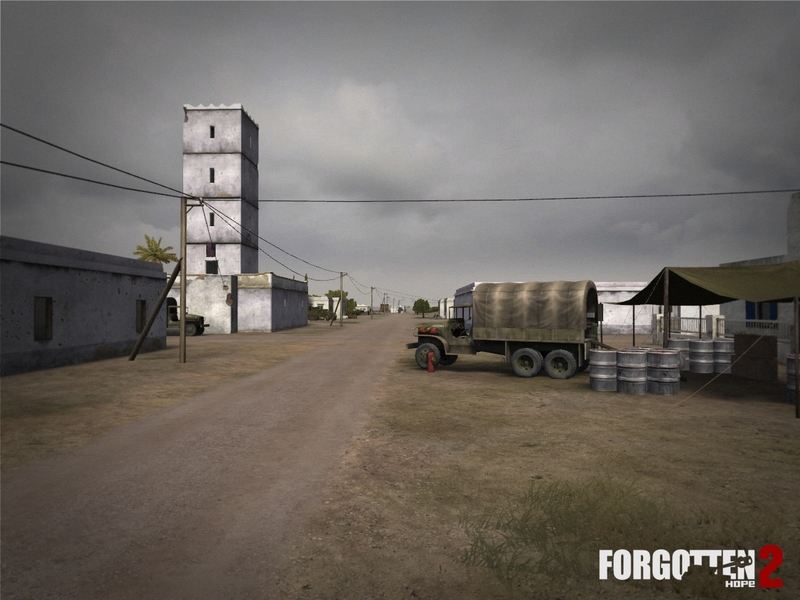 As well as the release date, today we'd like to tell you about the third and final map that features in version 2.45. This time we find ourselves on the flat and dusty landscape of Tunisia. In attack and counterattack, both sides will have a helping hand from the abundant flora that makes this landscape so different from the sandy wastes you might be more familiar with. The map Sidi Bou Zid was made by Lili Marlene. We'd like to start today's update with a trailer made by betatester Kubador. We hope you enjoy it as much as we did! While you are watching the trailer, why not prepare yourself for tomorrow's release by downloading the passworded torrent files. The password to extract and install these files will be released tomorrow at the same time as the non-passworded direct download links. You will need a bittorrent program to download these files, many of these can be downloaded for free. 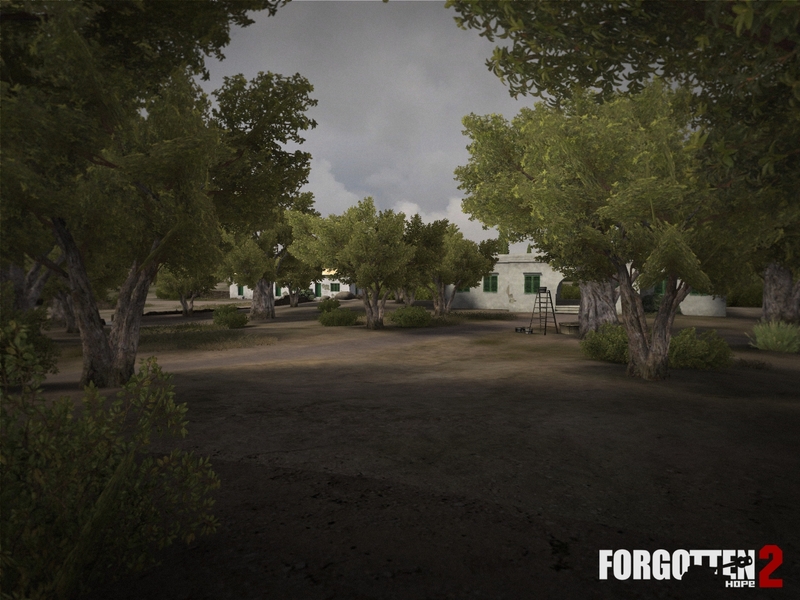 The following torrent contains everything you will need to play Forgotten Hope 2.45. Unfortunately, there is no patch from 2.4 to 2.45. The torrent contains two password protected RAR archives containing the installers, when the time comes you will need to extract both and install them. This mod had endless potential. Too bad it compromised everything with arcade gameplay, "nothing what I do or lose matters" style of asset use and ridiculously small maps.